In the past week, I’ve gained almost 150 followers- I’m truly blown away! I know not everyone was here just for the giveaway, because we had 166 total entries- and since a lot of people entered twice, I’m going to roughly guess we had around 100-125 people enter. I really enjoyed reading everyone’s comments! I truly hate not being able to give everyone Floam or Jawbreaker in particular- I know that these are lemmings for so many of you. I was so overwhelmed with the support and interest, that while it’s not the coveted indies- I did add a few ‘bonus’ prizes after I drew the first 3. I will say- a LOT of people didn’t exactly follow the rules I tried to clearly lay out. Because of the sheer number of them, and because I really am too nice, I was fairly forgiving this time around. But ya’ll, I really can’t allow entries that don’t follow the rules next time- it’s not fair to those that did follow. Please, please follow the directions (all the winners did though, which was pure luck). In case anyone was wondering- I manually added every person’s entry to a giant Google spreadsheet with their name, entry method (follow or share), and prize preference if applicable. As an extra level of being sure, I had 2 other people double check my list to ensure I didn’t miss anyone. Then I used random.org for the winning numbers! So without further ado, here’s the winners list!! FLOAM will be going home to: Julie Bennett! JAWBREAKER will be going home to: Christina Struble! The Pretty and Polished minis will be going home to: Maile Louie! I need the winners to reply to me via Facebook messaging on Polish Monster or via email- thepolishmonster@gmail.com. 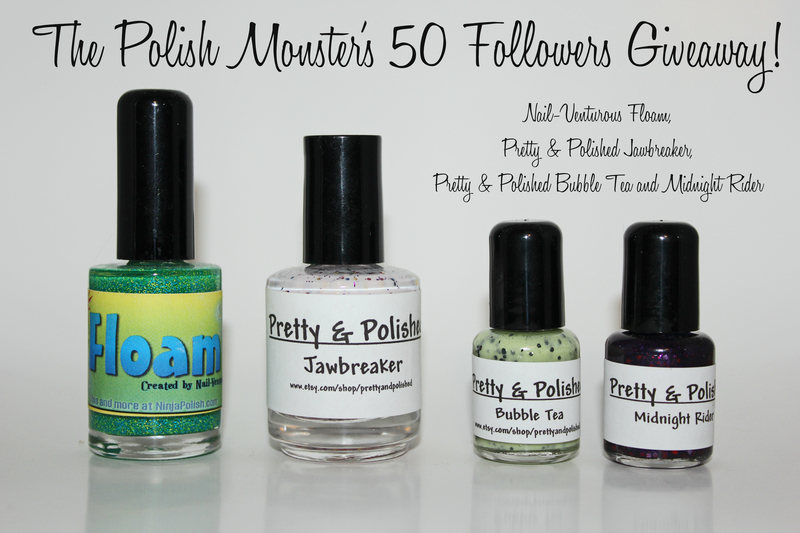 I will give winners until TUESDAY to get in touch with me with their shipping info- and in the case of the ‘surprise’ winners, a polish choice (I have a few Sinful Colors and other small drugstore colors to pick from). If in the event I haven’t heard from a winner by Tuesday evening, I will re-draw for that particular prize. I REALLY don’t want to have to do that! CONGRATULATIONS to all the winners, and thank you to everyone for entering! I promise more fun giveaways in the future… I had originally planned on a 100 follower giveaway, but we blew past that while this one was live! Maybe 250? This entry was posted on July 8, 2012 by The Polish Monster. It was filed under Uncategorized . Thank you so much, Diana!!! 😀 I’m so excited about Floam I could just SCREAM and run around like a fool. XD Thank you again!